Ready for the great adventure ? Ready for a ride on this bike ? What about descending a mountain on two wheels ? Going through amazing forest ecosystems ! With great camping experience in between ? Come with us for a great adventure tour ! 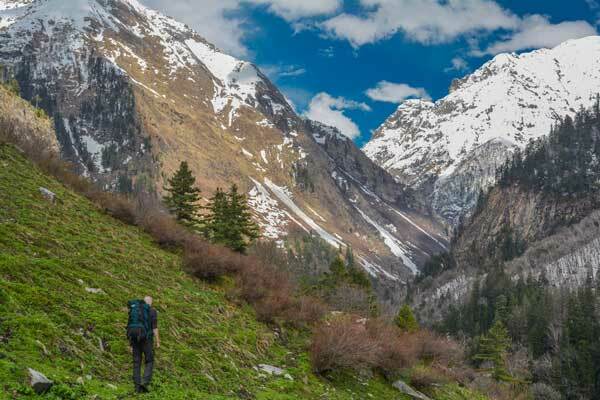 Himachal Pradesh is the home of Himalayan Ecotourism. We are all passionate about mountains and we love to spend our time amidst natural beauties. Undertanding that you may have the same love for adventure in nature we have developed a 10 days program which blends treks, cycling, biking, camping, sightseeing and other adventure activities. The tour starts from Shimla, capital of Himachal and ends in Manali, via the Kullu valley of Gods, the Tirthan valley. The proposed tour is illustrative of what we can organize for you and hence it is completely customizable. The tour is being organized for groups only. We suggest you to come in a group from 6 to 10 participants. From Shimla we take the motorbike up to Mandi. Then it is a gradual climb by cycle and on foot up to the spectacular Shikari Devi. The trek continues up to Jalori pass from where we go down on cycle. Best time for Adventure tour is April, May, June, and then October and November. This is an illustrative tour of 10 days but it is completely customizable. Shimla On the first day you have to reach Shimla by your own means. If you need help on this just enquire. Enjoy the mall in the evening. Night in a hotel. Mandi Today we will enjoy biking on Royal Enfield. We spend the entire day on the bike going through marvelous road sceneries. For those who don't drive bike we can arrange another vehicle. Night in a hotel in Mandi. Chailchowk This morning we take you to a small village where you take a mountain bike. You have a nice drive on a beautiful ridge overhanging the entire valley. Enjoy the day to acclimatize with altitude. Night in a small hotel. Kamrunag lake You have a choice of either go on foot or by cycle. 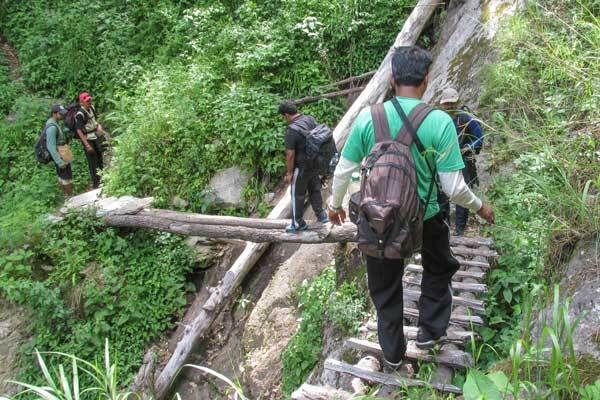 The trekking trail is easy and winds on the ridge covered with very nice forests up to the Kamrunag lake. We spend the night in a camp that we set up for you in an exceptional spot with great view of the Himalayas. Shikari Devi We continue on foot towards the amazing mountain "Shikari Devi" that offers a very spectacular view of the entire Himachal Pradesh and beyond. We spend the night in a camp that we set up for you in the valley. From Shikari you can go down on cycle. A thrilling descent ! Jalori pass We take on to a pass by a jeep. From the pass you continue on foot. Again you are on the ridge of a mountain. We want you to enjoy non-stop the Himalayan sceneies ! You reach Jalori pass in the evening where we are waiting for you with a nice camp. You reach Jalori pass in the evening where we are waiting for you with a nice camp and food. Tirthan valley You will really enjoy the descent from Jalori pass on mountain bikes. You cycle up to a nice guest house by the riverside and have a relaxing night. Tirthan valley Today we spend time doing some mountain activities. You have a choice of fishing, river crossing, rappelling or even rock climbing. Night at the guest house. Kullu - Manali Today we take you to Manali. On the way we stop to do white water rafting on the beas river. Night in a hotel in Manali. Check-out You check out at the hotel and then you are free. On your request we can organize your return to home. Outdoor adventure for your team.